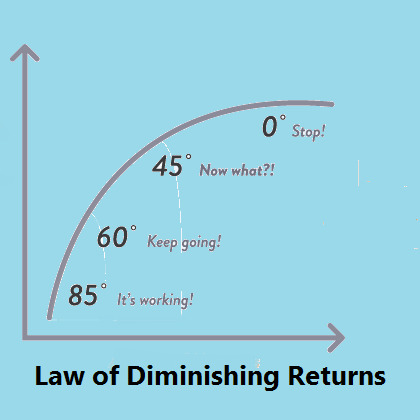 Technically the law of diminishing returns is an economics theory, but it does have application in just about every area of life. The basic concept states that at some point adding more of a factor of production causes a relatively smaller increase in output. A traditional example of the law of diminishing returns is taken from farming. Let’s say that a bushel of corn seed planted on an acre of ground will yield one ton of corn. Planting a second bushel yields 1.75 tons of corn. Adding a third bushel yields 2.25 tons of corn. With each additional bushel of seed the output does increase, but the amount of the increase is smaller with each additional bushel of seed. That’s diminishing returns. What does that have to do with the SMOK TFV12? 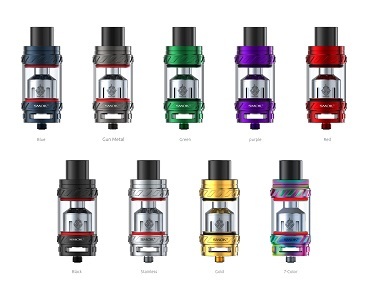 This is the third iteration of the SMOK TFV tank series. The first was the TFV4. That tank was an amazing advancement in sub ohm tanks, providing an incredible increase in both vapor and flavor production compared to any other tank that had come before it, at least compared to any other tank that I had used. Then came the SMOK TFV8. This tank boasted coils that could handle higher wattages and increased airflow which combine to produce more vapor and flavor than the TFV4. The most recent addition to the line is the SMOK TFV12, with coils with even higher wattage allowances and another increase in airflow. And yes, vapor and flavor production have again been increased. Maybe not be as much as was the case with the earlier TFV tanks, but it represents an increase all the same. Then there’s the 0.15 ohm V12-X4 quad coil with a range of 60 – 220 watts and a “Best” range of 100 – 170 watts. This coil is described as “brings deep and rich cloud taste.” The third coil is the 0.15 ohm quad V12-Q4, described as “brings smooth taste.” It has a range of 60 – 190 watts with a “Best” range of 90 – 160 watts. Performance: Vapor and flavor production are amazing on the SMOK TFV12. The inner diameter of the airflow tube and drip tip are the biggest SMOK has ever made, and the airflow control is also increased. The major contributors to all of that vapor and flavor are those coils. So far I’ve used two of the three coils included, the V12-T12 and the V12-Q4. Each of them has lived up to their descriptions. 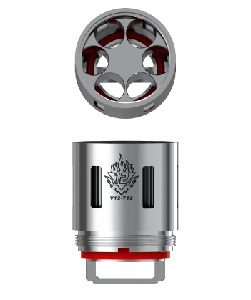 The T12 produces huge clouds and the Q4 does produce a smoother vapor. Both provide rich, deep flavor, highlighting the nuances of every ejuice I’ve vaped in the TFV12. 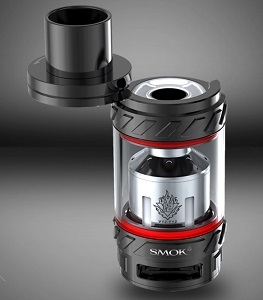 Features: SMOK includes a fair amount of features in the TFV12. The swivel top fill system is convenient and minimizes the chance of messiness while filling. That healthy 6 ml capacity is a solid feature. The inclusion of a tank band, extra glass tube and O-rings are all nice features. The strength of the SMOK TFV12 is in the coils. And the fact that SMOK includes three different types of coils is a great feature. That gives you an opportunity to try three different types to find the one that best suits your style of vaping. SMOK also offers several other replacement coils, including the V12-T8 0.16 ohm octuple coil, the V12-T6 0.17 sextuple coil and two RBA decks. 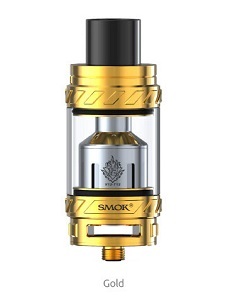 SMOK offers the TFV12 (so far) in black, silver, gold, seven-color, blue, gun metal, green, purple and red. Quality: Made from stainless steel and food-grade glass, the TFV12 is a high quality piece of equipment. The swivel top fill is a bit on the stiff side, but that means it’s not going to swing open accidentally. The coils perform well. I was a little disappointed that the V12-T12 coil only lasted a little longer than two weeks, but I did do a good deal of vaping during that time. As with all of the TFV tanks, the TFV12 is a bit of a juice hog. Looks: This is an impressive looking tank. It’s huge, well crafted and attractive. The SMOK logo is subdued. And through all but the darkest ejuices the logos on the coils are visible. Price/Value: SMOK lists the TFV12 for $59.99. 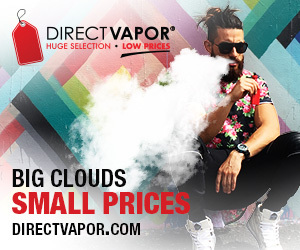 Huff And Puffers, who supplied the TFV12 for Seven Report to review, lists the silver TFV12 for $32.99, the black, gold and seven-color for $34.99. That is an amazing price for such a high performing, feature rich tank. The coils for the TFV12 are going to probably run you a little more than those for other tanks. SMOK lists a 3-pack of the V12-T12 coils for $29.99. Again, Huff And Puffers has a much sweeter deal, listing those Duodenary coils for only $17.99. 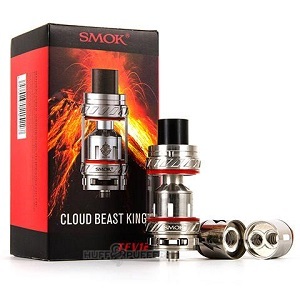 The other available coils for the SMOK TFV12 are less expensive. This is where that law of diminishing returns comes into play. 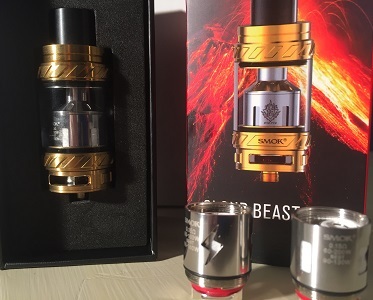 If you already have one of the earlier TFV tanks, is there enough of a difference in the TFV12 to justify the expense of initial purchase and replacement coils? That’s a question only you can answer. But if you do decide to pick up the TFV12 you’re not going to be disappointed. I have been so impressed with the SMOK TFV12 that I bought one for my wife, and she is really enjoying it. The SMOK TFV12 is the pinnacle of the TFV series. It produces the maximum flavor and vapor that I’ve experienced with any tank. With its wide range of available coils and RBA options, this is a tank that will meet the needs of any vaper. Just be sure that you have a mod that’s capable of firing those monster coils. I’ve been vaping with the SMOK TFV12 for a little over three weeks, using it on the Kangertech KBOX 160. I’ve vaped quite a few different ejuices in it and it has produced rich, full flavor with every one of them. Huff And Puffers provided the SMOK TFV12 for the purpose of this review. Order the SMOK TFV12 from Huff And Puffers.